Ah, December is here with the rain to clean up the air, the spiders off the plants and the nuisance illnesses of the winter. Outside is grey and cold, inside my house is warm, the fireplace has been on since the start of the morning making my house nice and cozy all day. I am so thankful to have found an older home with charm and a fireplace. This morning I was thinking of the special food to cook today. After all it is Sunday, a special day for resting and enjoying food with those who like to eat. My friends forget to leave when invited to my home. At times I wonder if they come for me or for my food. I am thankful for my friends and for having food to offer. I am a bit behind reading blogs of my followers; while food was cooking I read many to ketch up. Everyone is so talented and write attractive stories or subjects, which makes it really hard to choose. “Everyone is a star and needs to shine”. ~ Marilyn Monroe. I am so thankful for my friend bloggers following me. December is the month to celebrate a new light coming to the world, a new winter solstice, religious events and it is the month for giving. Cities looks so beautiful with the building tops crowned with lights, colorful displays make designed stores very inviting and front yards of every home are decorated to perfection. I am grateful and thankful to have eyes to see the colors that illuminate my world. 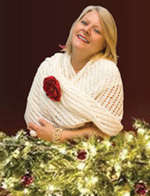 Jamie of http://grandmothermusings.com who writes slices of life with humor and knowledge. Unlike other awards, which you can only add to your blog once, this award is different! There are a total of 6 stars to collect. Which means that you can check out your favorite blogs – and even if someone else has already given them the award – you can still bestow it on them again and help them to reach the maximum 6 stars! Valentina Cirasola is an interior designer and a former fashion designer in business since 1990. She helps people realizing their dream spaces in homes, offices, interiors, exteriors, restaurants and more. She needs your story to design your dream. Thank you so much. Congratulations to you as well, I know you have receive the award. Please accept my apologies for getting to you so late. I was out of town. Thanks so much for the nomination. How very kind of you. I wish you and your loved ones a happy holiday season. Take care! Enjoy the award and happy holidays to you and family as well. Thank you Stefan, you are very kind and I am so honored. I will write a post today. Stefan, you are such a darling, thank you, I am honored to accept your award. Thank you MisBehaved Woman, nice to meet you. Thank you Kenley. Create a great week. And thank you so much for recognizing my blog. I appreciate it. I feel honored to be included with Sindy!! She is incredible!! Her spirituality is felt through the computer. I will definitely check out the worthy blogs I do not know. Thank you again! Thank you Marianne and congratulations to you. Create a great week. Oh what an honor to be in the company of such classy bloggers! Thank you sweet, talented and beautiful Valentina. I only used three adjectives but there are many more of praise I could assign you. Judy, well she is just awesome. I am not familiar with the other nominees but I will be. Again my deepest gratitude for the acknowledgement. My pleasure Sindy as always. Enjoy it and get as many stars as you can.